Hopelessly plateaued – that was my running prerogative for years! I started running as a way to lose weight in college and could barely run a quarter mile, I stuck with it for the challenge it brought…and a challenge it was! It wasn’t until I met my husband, stumbled upon Sunday Runday North (#OrangePower! ), and met some FAST running friends that my competitive drive found me and my eyes were opened to what it takes to break my plateau. Then, in early 2017, after months of mystery illness, I was diagnosed with Celiac Disease. 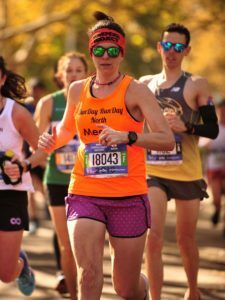 The diagnosis was life changing, but found myself refocusing on health like I never had before – which ended up catapulting my race performances. I’m a KC native. I’ve been brought up by the KC running community and now, after a couple years of consistent PR’s, I am ecstatic to be able to represent my city wearing KC Smoke colors! My goals are to keep chipping away at all my distance times…5k to the marathon, and throw in a few duathlons and triathlons along the way. Be it for training or chasing a PR, no doubt you’ll see me in every corner of the city doing local races and supporting Celiac Disease awareness, both inside and outside of the running community.